Since 2007, I have been active in research in Gravitational Lensing, specifically studying galaxy clusters. The gravitational effects of foreground masses alter the shape of background images. Such image distortions are related only to the mass density of the foreground mass, independent of the type of mass, ie plasma, stars and dark matter. Gravitational lensing studies reveal characteristics in shape of objects otherwise unseen, i.e. Dark Matter. My work is focused on the simulation of gravitational lensing effects, including both ray tracing and shear calculations, in order to better understand dark matter halo shapes. Both simulations can be performed with arbitrary mass distributions. For faster results, calculations are done in parallel with the distributed computing project I created using the BOINC system, derived from the SETI@Home project. With these simulation systems, dispersions in triaxiality values of galaxy cluster dark matter haloes can be related to the shear values they produce. A list of presentations that I have given on the subject of gravitational lensing can be found here. A general library with functions for text processing and numerical calculations. Examples include string to number processing, Fast Fourier Transformation and numerical integration. A library for performing gravitational lensing ray tracing calculations. This includes objects to handle two dimensional mass and image distributions and routines for cosmological distance calculations. Program to perfrom gravitational lensing ray tracing for arbitrary mass distributions. This program was designed to also run in parallel for faster computation. Interactive cosmology utility. 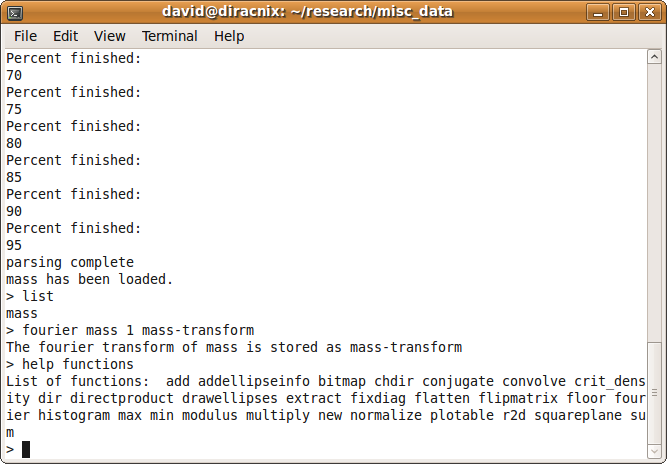 physcalc uses my libraries to perform lensing and other calculations in cosmology. Here is a screen shot of a previous build of physcalc. Routines to convert N-Body mass distributions to 2-dimensional convergence planes are included in mycosmo.